Well hello there !! Jeez what a fabby few days I just had, and boy oh boy do I know I have 2 legs. 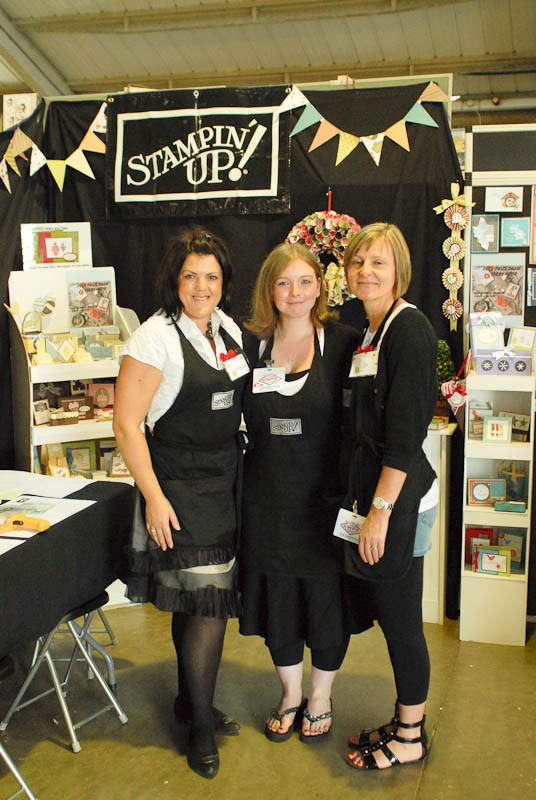 The experience was such a positive one we talked with so many people over the last 2 days spreading the word and promoting Stampin'Up! I met and hugged fellow demonstrators, I met some of my lovely and loyal customers (waves to both glamorous Cath's and gorgeous Mariana and Kathy C.) I met old friends and made new ones. I got to squeeze the gorgeous Ellie and her fabby Mummy THE KIRSTY WISEMAN, we met with people who knew who Stampin'Up! was and squealed with delight when they saw us there ( they know you see). We met excited customers saying WE ARE CONVERTS!! (so funny) who already had a demonstrator service them, and demos I am afraid I am a bit guilty of sending your existing customers that visited our stand into a bit of a frenzy over the new catalogue, I hope they will take my advice and get in touch to book their parties. And that was music to our ears because that's what we are all about at Stampin'Up!, COLOUR the fabulous colour coordination across our range. It took us 2 1/2 hours to get the basic structure right after moving it around 3 times (even thought I had made a clear plan ahead of time where things would go), well my excuse was that it didn't work in situ and it had to be changed so we changed it, THREE TIMES heee hee. We were pleased with the results in the end thank God as the security guy was getting very impatient in the end. We had a ton of samples on display, and 3 boxes plus one stand didn't even make it. People loved admiring the projects and taking lots of photos. Most of the projects were ones I created myself but the vast majority were lovelies made by my talented team, and fellow demonstrators so I hope you will get to spot some of your own work displayed on the video later on. I need to mention Fiona Duthie and thank her publicly for her amazing paper wreath (above photo) she made for me, Fiona everyone LOVED IT !!! thank you so much. Now I would have not been able to do any of this without my fabulous team of Passionettes. And while a few of them are not official Passionettes yet, they are in my eyes until their starter kits arrive, I LOVED working with you girls what a great bunch of ladies!! Thank you so much girlies for all your help what a team we are !!!! Here's me, Jo and Kim on Sunday, unfortunately I left my camera at home Saturday and I haven't got pictures of Jane and Alison but you can see them both briefly at the beginning of the video. We did 150 FREE makes n takes over the two days and Ali and Kim were both our demos extraordinaries, everyone loved the TREE TRIMMINGS set and loved the SMAJ even more. I will leave you with a tour of our stand, you will have to excuse the poor video skills I was trying to get it done before the doors opened and everyone started pouring in. 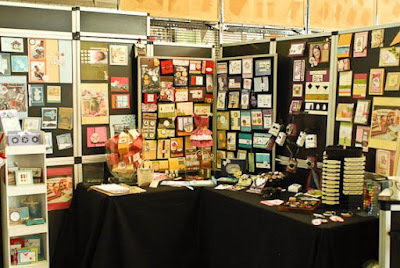 THANK YOU TO EVERYONE who visited our booth this last weekend, thank you for the lovely comments and compliments, Caroline THANK YOU for the chocolates (that was so very kind of you). I enjoyed meeting every single one of you, and I hope to see/hear from you soon. Amazing!!! I love the dress, can I order one- size 18 please lol hahahahhhaha. Best wishes Gorgeous display, WELL DONE GIRLS. Fab stand Monica, love the dress you made. 1st October finally arrives (or even sooner). And I saw my Christmas card....woohoo!!! I'm flattered Monica, thanks for the 'gorgeous' part. It was absolutely lovely to meet you, I wish I had a bit more time to hang around (I took photos of your creations though, and I will be trying to come up with some things as good as yours). Very inspiring Monica. Looked fantastic. I just thought I'd stop by and say hello. 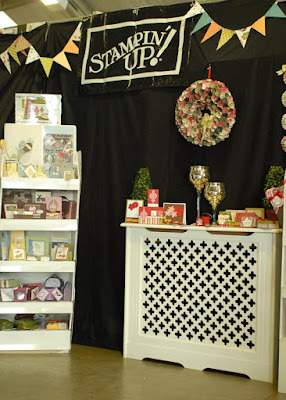 Your stand at Harrogate was amazing, and you and your Pasionettes did a fantastic job. You might not believe this, but I had never heard of Stampin'Up before I met you! I so love the philosophy - the way that the colours go together so well and that everything matches. I enjoyed the welcome half hour sit down with the make and take - thank you very much! Thanks Monica - It was a pleasure making the wreath for you!